The Sony Cybershot DSC-W300 is the world’s first compact digital camera to offer a sensor with 13.6 Megapixels of resolution. 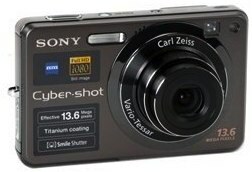 The Cyber-shot W300 is a pocketable and compact digital camera designed with point-and-shoot simplicity. The W300 has 16MB of internal memory. You’ll need to purchase Memory Stick Duo or Pro Duo cards for additional storage. Carl Zeiss Vario-Tessar 3x optical zoom lens. Zoom range is 35-105mm in 35mm equivalent terms. Ultra-hard titanium coating offers premium look and finishing while being highly-resistant to scratches and fingerprints. The W300 features Sony’s Super SteadyShot optical image stabilization (meaning, in the lens rather than the sensor) to reduce the the occurrence of blurry photos resulting from handheld shots taken with low shutter speeds. The W300 can automatically boost ISO to 6400 when you’re taking photos in low-light conditions. The NR (noise reduction) strength is user-selectable from the following values: High, Low, Standard. Sony claims that with the Low setting, noise is reduced without sacrificing too much detail. High-definition component output capability on the W300 means you can view photos on a compatible HDTV set. The W300 allows you to capture 3 MP photos at 5 fps (frames-per-second) when its on extra high-speed burst mode. At full 13.6MP resolution, you can only capture 1.9 frames every second. Sony claims that the camera is able to recognize faces in the scene and can be set to automatically take the photo the minute the subject smiles. With this feature, the W300 automatically adjusts exposure, AF (autofocusing), white balance and flash control for up to 8 faces in the scene. The W300 automatically selects the appropriate camera settings depending on one of five detectable scenes the camera is presented with. An advanced mode allows you to take two photos in quick succession — one with automatic settings, and the other with optimized settings. The W300 has 9 focus points. There’s a provision for optimized auto focus in macro ranges. 5 color modes are available. One of them is the “Real” mode which applies less in-camera processing to photos and gives a more faithful color reproduction. 12 scene modes. There is an “Underwater” mode which adjust the camera’s white balance so that your snorkeling or diving photos come out looking more natural, and not with the usual bluish tint. D-Range Optimizer Plus adjusts the photo so that the darker, shadow areas are lightened up a bit, while detail in harsh highlights is retained as much as possible. I like the version presented on DPReview.com. When you’re at the W300 gallery, don’t forget to hit your browser’s refresh button to view the next set of random images.